Intrigued to see a large colour ad for Terminal 5 from BAA (the British Airports Authority) in the Sunday Times Business section this weekend. 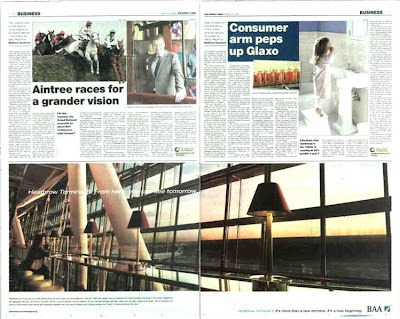 The ad features the straplines "Heathrow Terminal 5, from here you can see tomorrow" and "Heathrow Terminal 5, its more than a new terminal, its a new beginning." The ad text says: "Wherever you're going, you want getting there to be as easy and enjoyable as it can be. That's the reason why we've invested £4.3 billion building Terminal 5 at London Heathrow. It's designed the way tomorrow's airports will be - around people, not just planes. So our new technology will help make your journey simpler and faster."